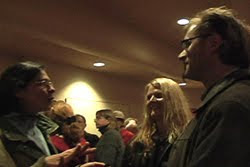 In late October 2008, we appeared on the Wisconsin Public Television show Director’s Cut. We talked about our documentary, Mad City Chickens, showed clips from the film and even had live chickens on set. The episode is still online at the Director’s Cut website. 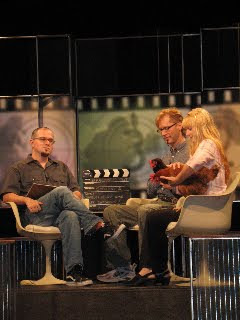 Before and during the taping of the program, a member of the PBS crew shot some “home video” type footage of the set, the show and the chickens. WPT has now uploaded this footage on youtube so you can get a behind-the-scenes look as Director’s Cut goes to the birds, err, chickens. Mad City Chickens accepted into 2009 Victoria Film Festival! We recently learned that the Mad City Chickens documentary has been accepted into the 2009 Victoria Film Festival in Victoria, British Columbia, Canada. The festival takes place January 30th-February 8th. VFF attracted 16,500 attendees in 2007 including film directors, producers, distributors and TV programmers. This year’s festival schedule is still being organized; we'll announce the exact screening date and time as soon as it is known. Emmy Fink, the feature story reporter for the CW Network recently interviewed longtime Madison backyard chicken owner Amy Liem, along with both Tashai & Robert. The subject matter was, of course, Mad City Chickens. 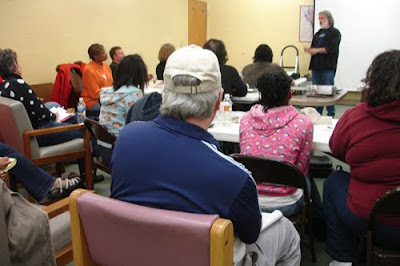 The TV segment will air on the Madison CW channel, this Tuesday December 2nd, 2008 at 6:50am, 7:50am and 8:50am. As we draw closer to the spring 2009 DVD release of the Mad City Chickens documentary, we’re also nearing completion on the many DVD extras that will accompany the film. Two sneak peaks have been uploaded today to our Tarazod Films youtube page. The first clip (shot by our friend Joe Fleischhacker) is behind-the-scenes footage of the MCC premiere at the 2008 Wisconsin Film Festival. 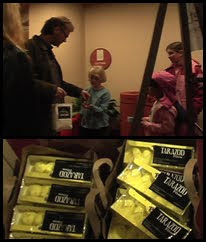 We had help firing up the sold out crowd in the form of free goodies including buttons, chocolate eggs and boxes of peeps. The second youtube vid is one of the many deleted scene extras. With over 40 hours of raw footage from the original tapes, there was just no way to fit it all into the final 80 minute film. So DVD viewers will be treated to a plethora of never-before-seen chicken stories. 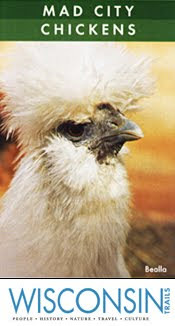 Hear Elizabeth Arth’s tale of how her pullet named Dolly suddenly turned into a rooster in her backyard. Michael Levenston of the Vancouver-based City Farmer News blog did a write-up on our recent Wisconsin Public Television appearance with a plug for Mad City Chickens which will screen in the upcoming Urban Issues Film Festival in Nanaimo, British Columbia. 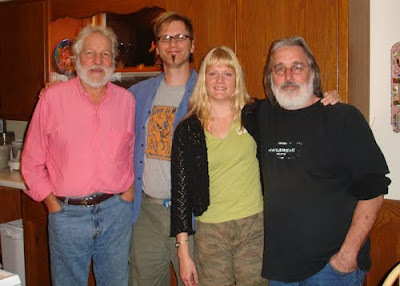 We were interviewed back in August by Charles Monroe-Kane, host of the Wisconsin Public Television show Director’s Cut. We talked about our documentary, Mad City Chickens, showed clips from the film and even had live chickens on set. WPT has informed us that the show is scheduled to be aired on their analog channel this Saturday evening October 25th at 10:00 pm. It will also be airing five times on their digital Wisconsin Channel from 10/24-10/27. And for anyone outside of the WPT viewing area, the show will soon be uploaded to their website. 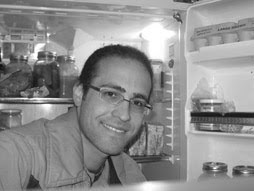 Not Docs is a television show for the lover of independent short films. Produced by Robert, it has run for the last two seasons on WYOU Madison’s channel 4 (now digital 991). Each episode showcases the work of one or more independent filmmakers with a focus on narratives, experimental and art films rather than documentary…hence the name of the show. But after two years, Robert is ready to move onto new film projects so this month will be the final airing of Not Docs before it goes into repeats. And it’ll be ending with a bang! Indie filmmaker Eric Lim’s sci-fi, action-packed, monster invading Zero Trooper-F premiered to a pumped up crowd at the 2008 Wisconsin Film Festival. Now you can see it this month on Not Docs! The film features an appearance by Matt Sloan of youtube’s Chad Vader fame. Our film Mad City Chickens was recently invited to screen at the Urban Issues Film Festival in British Columbia. In it’s third year, the festival links the World Town Planning Day with such issues as food security, hence the backyard chickens theme. This year’s fest is scheduled for November 21st in Nanaimo, B.C. 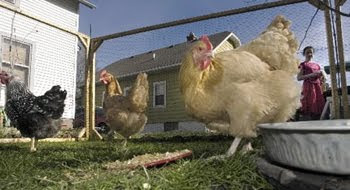 The Madison City Council passed a new chicken ordinance Tuesday night. The previous ordinance first initiated back in 2004 only allowed for single family homeowners to have chickens in Madison. The new law now includes apartment dwellers as well. 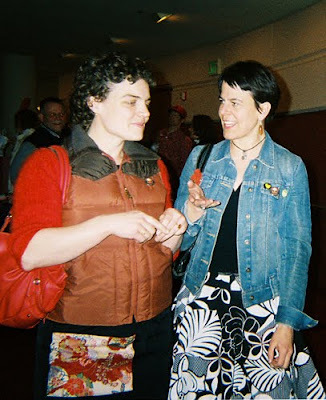 The ordinance sponsor, Alderperson Marsha Rummel, first got the idea for changing the laws last spring after interest in backyard chickens grew from the premiere of our film Mad City Chickens at Madison’s Wisconsin Film Festival. Because of this, local W.O.R.T. radio personality Gordon Heingartner gave Tashai a call yesterday and did a short interview with her for the popular news program In Our Backyard. 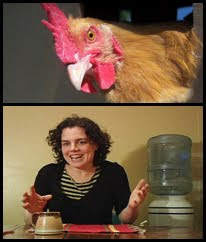 Listen to the mp3 file of the interview with Tashai and other local chicken experts. 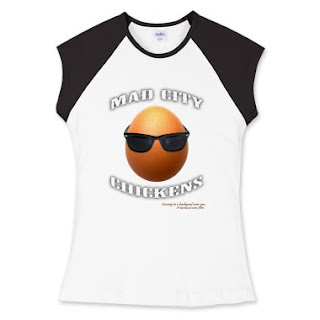 In our continuing efforts to raise money for the distribution of the Mad City Chickens documentary, we are now offering T-shirts for sale. They are being sold through our printfection webpage. After printfection fees, we net $10 per shirt. All proceeds will be used towards professional DVD replication, promotion and distribution of the film. Thank you for your support of true independent filmmaking. We were interviewed today at the Madison studios of Wisconsin Public Television. Charles Monroe-Kane, host of the show Director’s Cut, talked with us about our documentary, Mad City Chickens. We brought along a few clips from the film, as well as two of its stars, our former backyard hens Ricka and Flicka (previously known to us as T2 and Red). Their new owners, Jen and Evie Lynch also joined us in the studio and appeared on camera near the end of the show. The episode will air on Public Television in the near future. Elaine Belanger, the editor of the popular Backyard Poultry periodical, makes an appearance in our Mad City Chickens documentary. 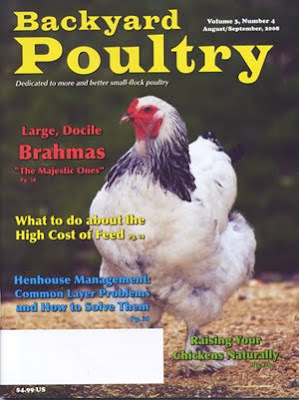 Read what she has to say about it and the film in this month’s editorial, Passionate About Poultry. We have been invited by Mary Pokorney-Donelan, the producer of a new series at Wisconsin Public Television titled The Director’s Cut . 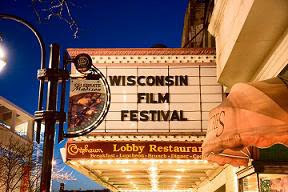 The program will focus on Wisconsin films and filmmakers and will be a combination of running clips of the films and discussions with host Charles Monroe-Kane. 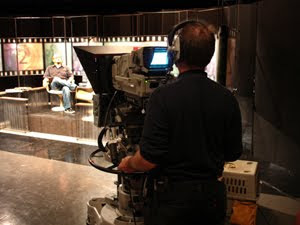 The Director’s Cut will air on WPT’s digital channel, The Wisconsin Channel, and Saturday nights on the analog channel. The episode on Mad City Chickens will be taped later this summer. The piece was authored by reporter Lynn Welch of the Capital Times, then picked up nationwide by the Associated Press. 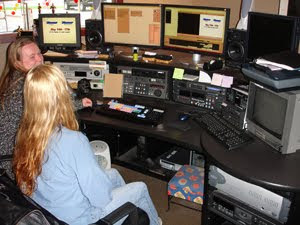 A Producer Rep can become attached to a film at any stage in the project, from development, during production, or simply at the distribution phase. For filmmakers, the best Producer Rep is someone who feels just as strongly about the film as they do. So what is a Producer Rep? The person with the connections…connections with the major festivals, connections with the major distribution companies…the person who can make the deal. The problem is…are they telling you the truth? Do they actually have these connections with people in high places? Or do they just want a large (non-refundable) chunk of money up front, without caring whether the film is sold or not? 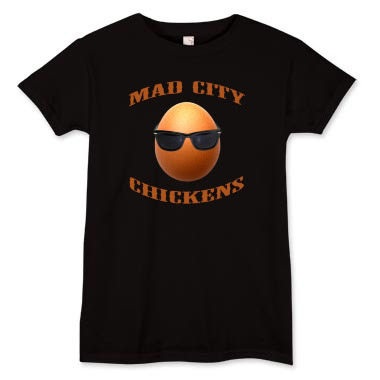 We are currently fielding calls from Producer Reps for Mad City Chickens. And it has been a very interesting stroll into the art business of filmmaking. The backyard chicken craze is really catching on and the media is picking up on it. Mad City Chickens gets noticed by writer Elizabeth Wegner in the June 2008 issue of Wisconsin Trails Magazine. Mad City Chickens was shot mainly in the SD (Standard Definition) format but not entirely. We did mix a number of HD (High Definition) clips into the final edit, and this has caused a slight delay in our film festival submission process. We’ve encountered some pixelation issues when compressing the film onto a standard DVD…too much information, not enough disc space. The problem will be resolved shortly, however, and festival submissions will continue. We were thrilled with the enthusiastic audience reaction to Mad City Chickens during the recent screening at the Wisconsin Film Festival. However, standing in the back of the room, we noticed a couple secondary pieces that didn’t quite work as we’d envisioned. (There’s nothing like a public screening to help iron out the kinks.) So we’ve spent the last two weeks re-editing those segments to bring them up to par with the rest of the film. Word of the film is getting out! We’ve been contacted by a Los Angeles Producer Rep who might be interested in assisting us in the film’s distribution. And in the meantime, Chickens continues to get invites from backyard poultry groups from across the U.S. and Canada. From Nova Scotia to British Columbia and Boston to San Francisco, people are looking for filmic support in their quest to keep chickens in the city, support that we’d gladly give. However and unfortunately, some of the major film festivals have strict restrictions on where and how many times a film can screen before they get it. So at the moment, we are limited on our public showings until we hear back from these top festivals. But rest assured, we’re planning on Mad City Chickens screening from coast-to-coast! 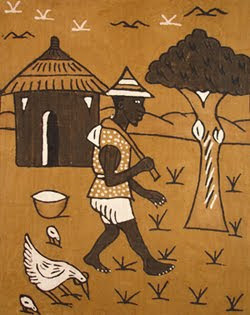 The tales and events in Mad City Chickens are all woven around the two main stories presented in the film. These are the experiences of Elizabeth’s family raising their first flock, and Liz’s rescue of a discarded factory farm bird she found at a landfill. Check out our Mad City Chickens flickr album for lots more (full size) pics. Mad City Chickens in the WFF makes FRONT PAGE News! OMG! With the premiere of Mad City Chickens happening tonight at the Wisconsin Film Festival, the documentary is making some headline news. Wisconsin State Journal offers up some tasty morsels on the film with a front page spread. Read page 1 and page 2. Check out the Mad City Chickens article written by Katjusa Cisar in this week’s local section of the Onion.